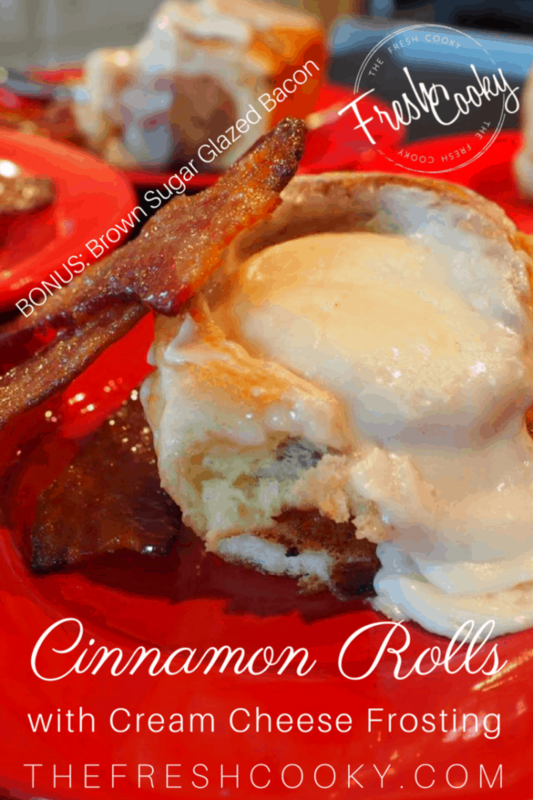 These cinnamon rolls are so very simple, with a little patience before you know it, you’ll have a soft sweet bread with buttery cinnamon gooey centers topped with an amazing, fluffy cream cheese frosting; better than Cinnabon Cinnamon rolls! Do you like funny stories? Well I’ve got a whopper for you, this one almost cost me my husband! He could see the look of terror on my face that he would even ask me this, I stammered and stumbled through the fact that we had to be back home that night, I couldn’t let my family down and not bring my cinnamon rolls, Easter depended on it! I actually argued with him for awhile, seriously, what was wrong with me, I must not like last minute changes or something! He naturally suggested we could just buy cinnamon rolls the next morning if indeed we did get stuck in the mountains. WHAT!? ARE YOU KIDDING ME, I don’t BUY cinnamon rolls…I could tell he must love me – A. LOT! He took my freaking out in stride and urged me to get my bag and we’d figure it out as we go. 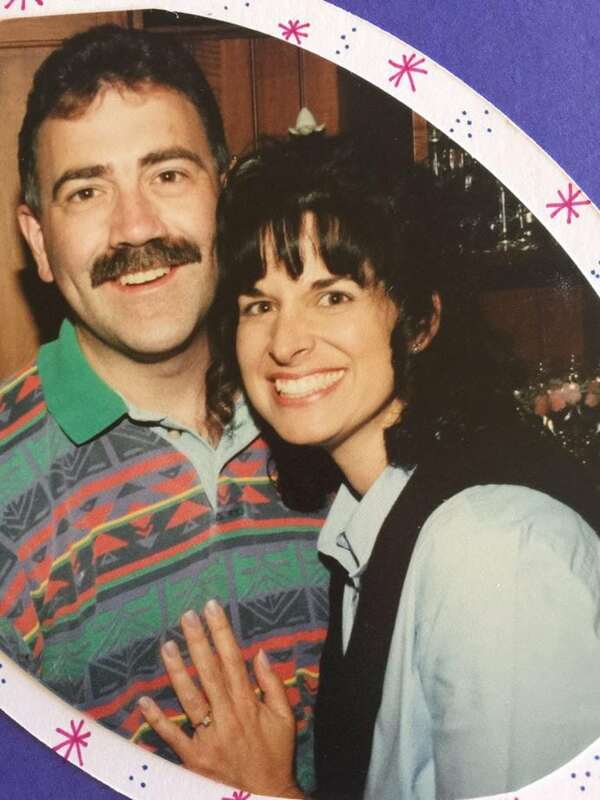 What I didn’t realize was that my dear, sweet, gentle, kind-hearted, loving and wonderful soon-to-be-husband had called my Dad (in Florida) to ask his permission to marry his 35 year old daughter AND he had driven all the way to Boulder (an hour) to ask my Mom the same thing, my whole family knew I was getting engaged and I was worried about not bringing cinnamon rolls!! Sheesh! 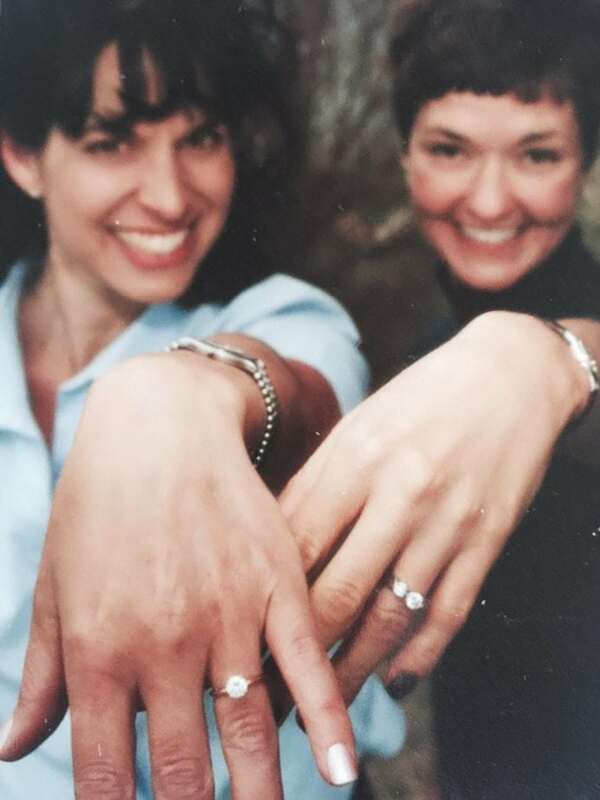 He had planned to propose to me atop Vail mountain. What we both didn’t know was there was indeed a freak spring snow storm and they had closed the mountain due to winds, thunder and lightning which thwarted his grand plans. He spent the day trying to secretly rearrange all his plans to accommodate the great sense of humor of our God. That evening, after a lovely dinner, as we traipsed through Lions Head towards the Gondola, under heavy wet snow (over a foot) I started hearing the strains of a song being played, specifically Van Morrison’s “Have I Told You Lately That I Love You.” I thought that was so sweet, but things still didn’t click, as we walked closer to the music, I realized it was playing on a CD player (a boombox to be precise, it was early 2000 after all! ), left on an empty picnic table, but nobody was around, hmmm? That’s odd. We were indeed snowed in as they had closed Vail pass and boy was I grateful for that change of clothes he insisted that I bring. We stayed the night at his friends house and headed home the next morning, store bought cinnamon rolls in hand!! 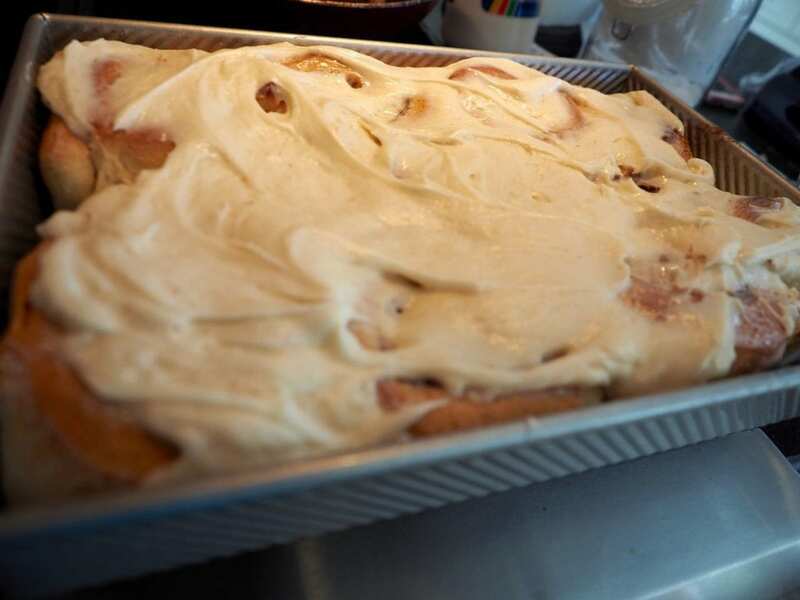 For several years I continued to make my grandmother’s overnight cinnamon rolls (it has become the family joke), but now I’ve learned that you can make them the morning of, no overnight necessary! I’ve spent 17 wonderful Easters with the man of my dreams, occasionally with cinnamon rolls, sometimes without! in the end it’s about the people, not the food! Do you have a crazy engagement story? I’d love to hear it! Thanks for hanging with me through that story, I love engagement stories, each one is unique. 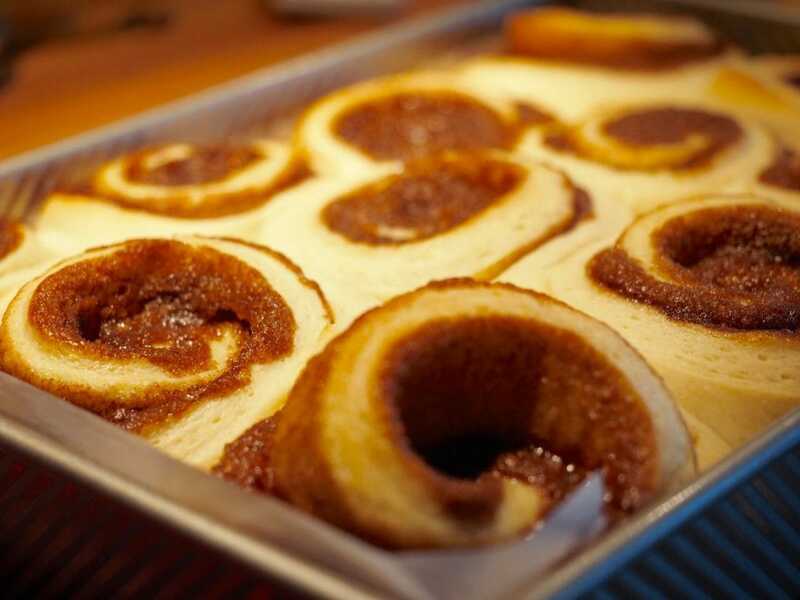 But let’s get going on these wonderful ooey-gooey cinnamon rolls. Place your milk, room temp butter, sugar and salt in a small saucepan and heat on very low, stirring occasionally. Heat until the temperature reaches about 120°, careful it gets hot really fast, your butter might not be fully melted, that’s okay. If you get it too hot (greater than 130°), just give it a couple minutes to cool down, you don’t want to scald your yeast or curdle your eggs. 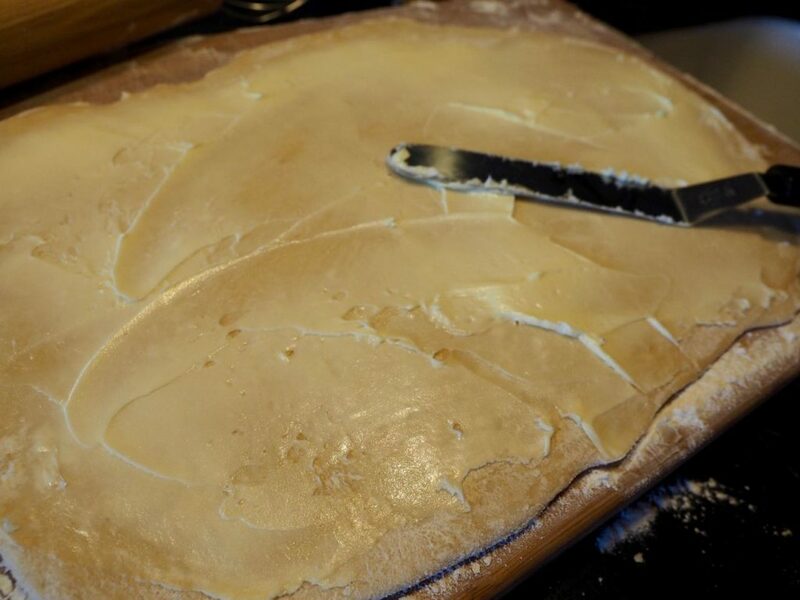 TIP | Take out 2 additional sticks of butter and your cream cheese to soften while you are making your dough. While your milk, sugar, butter mixture is heating, measure out 2 cups of the flour into the bowl of your mixer, add the yeast and mix gently. Slowly pour your milk mixture into the flour and yeast mixture, mixing on low. Note my full cup of coffee in the corner and a jar of marshmallow fluff, not sure what that was for! Must have been making Whoopie Pies later! Add room temperature eggs* to the flour and milk mixture and the rest of your flour. *HACK | Forgot to take your eggs out of the fridge the night before, like I always do? No worries, run warm, not hot water into a bowl and place eggs in bowl to bring to room temp, takes about 5-7 minutes. Once your dough is mixed thoroughly, replace your paddle attachment with the “J” hook and let it knead the dough for you, about 5-10 minutes until smooth and elastic. 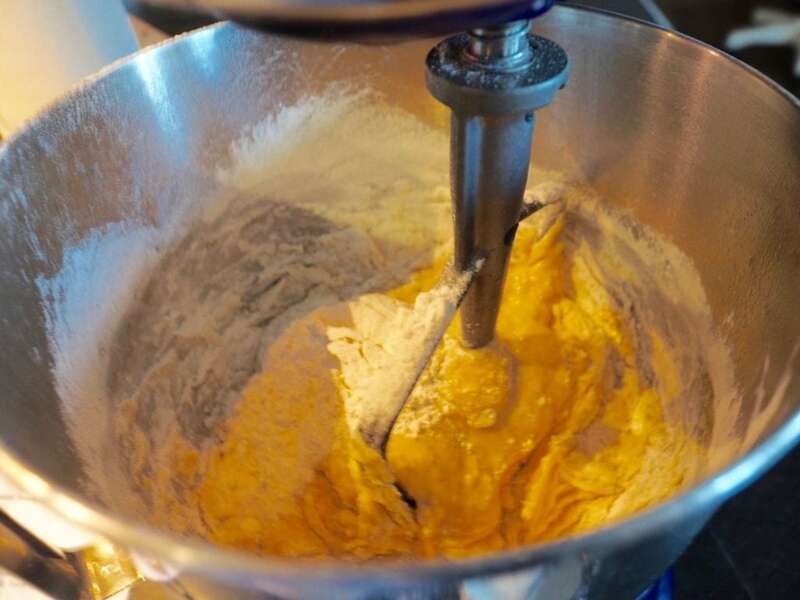 Don’t have a kneading hook, place the dough on a floured surface and get your upper body workout in for the morning, kneading the dough for the same amount of time, tossing in a little more flour if it gets too sticky. 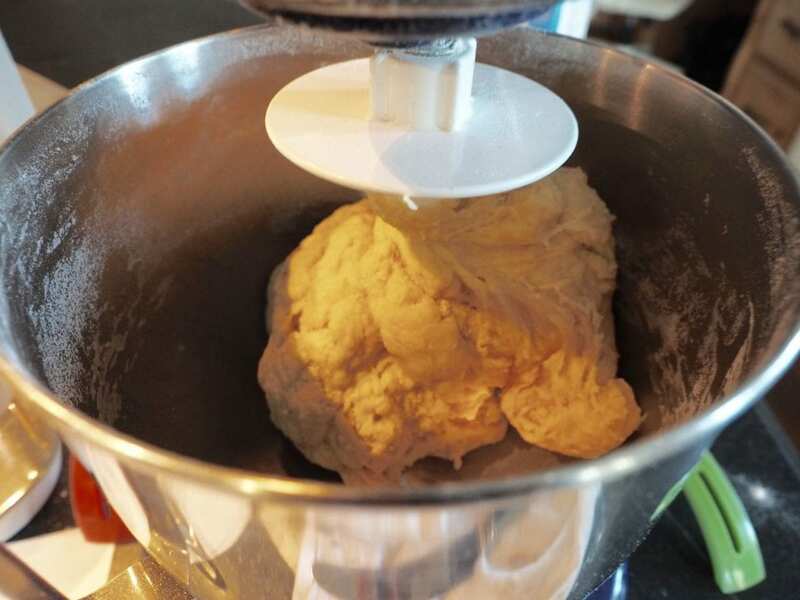 While dough is kneading, grease a bowl with a teaspoon of oil (vegetable), using a paper towel spread oil around bowl, plop dough in and turn over covering dough ball with oil. 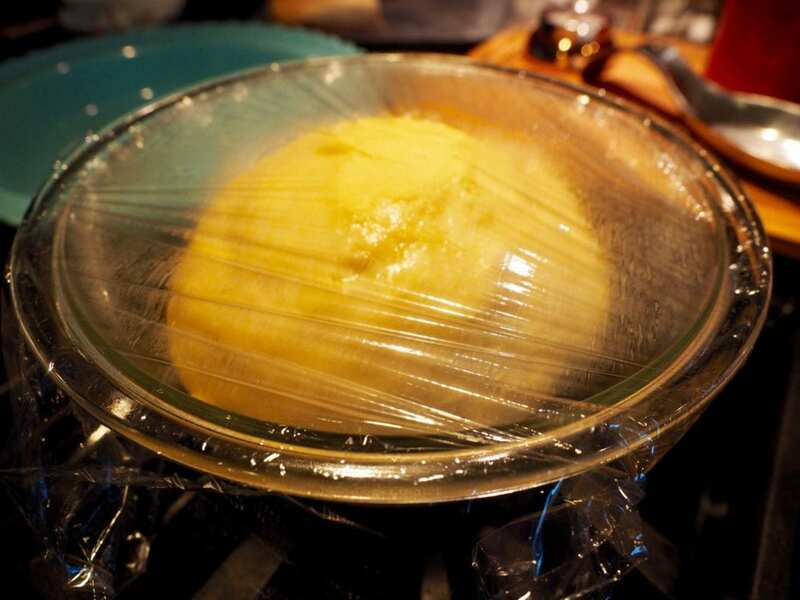 Cover with plastic wrap and place in a warm spot for about 15 minutes to rest. TIP | Need to make a warm spot? Preheat your oven on it’s lowest setting, then turn off oven. Place your dough in the now warm, but turned off oven. If your oven has a “proofing” setting, place on that setting and let rise for 15 minutes. Meanwhile in a small bowl, combine the brown sugar and cinnamon with a fork and set aside. 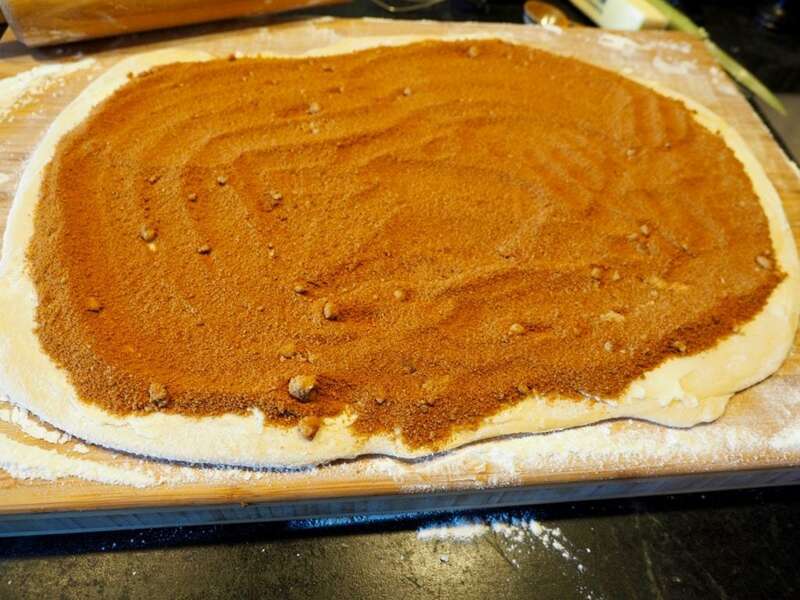 Once the dough has rested for about 15 minutes, place on a floured surface and roll out into roughly an 18 x 21 inch rectangle. I’m dorky enough that sometimes I will actually measure it, it’s okay to eye-ball it, you want it nice and large though. 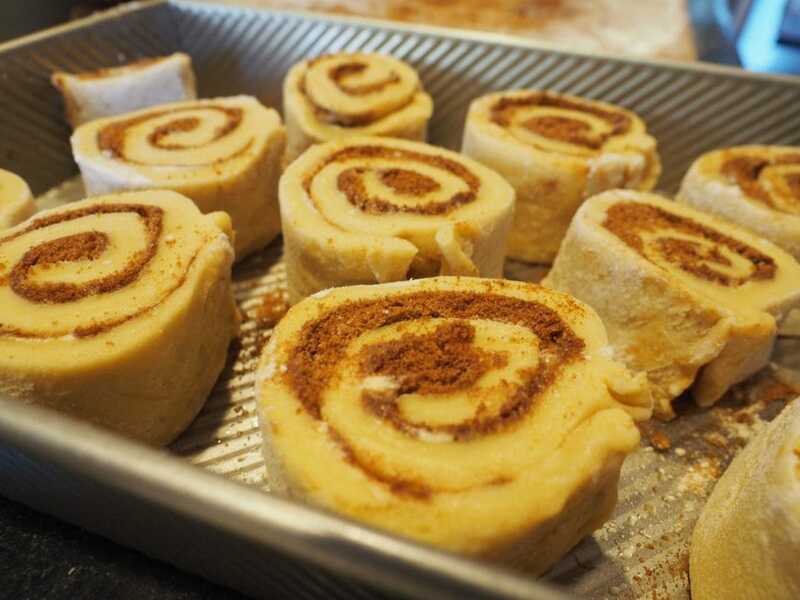 Spread your cinnamon sugar mixture evenly over the top of the butter within about ½ inch of the edges. Starting with the long edge, roll tightly into a log. Next slice into 10-12 even rolls, if you want to get all perfectionistic you can measure your log and divide evenly using a ruler, not that I’ve ever done that…wink, wink! I usually eyeball it making little slices and if too big or small, go back and remark it, however you slice it just try and make them even. Place in greased (buttered or non-stick spray) 9×13 pan or line with parchment paper, with space between each roll. 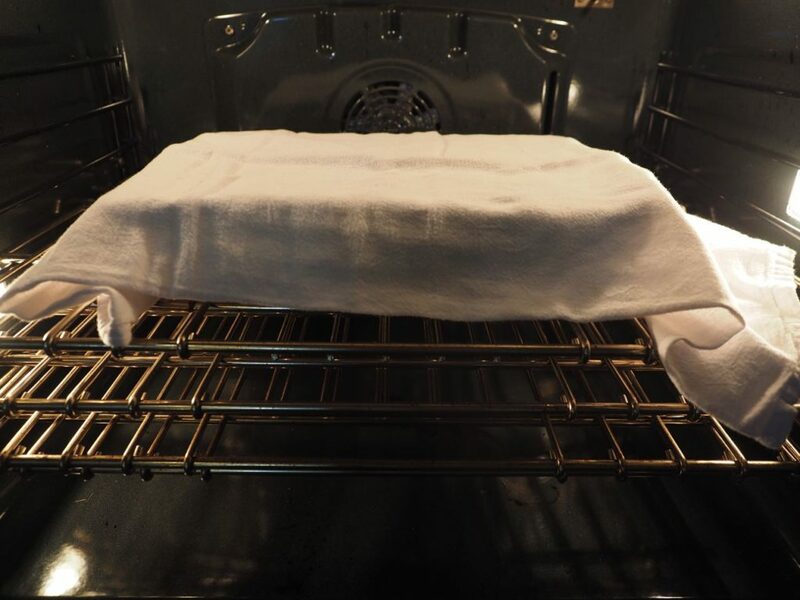 Cover with a clean, damp tea towel on top or cover with plastic wrap and return to that warm place to rise until nearly doubled, about 45 minutes. Preheat your oven to 400° (375 if using a dark or glass pan) making sure your rolls aren’t in that oven while preheating. Now, remove tea towel or plastic wrap and bake about 12-15 minutes, don’t over-bake, if anything under-bake slightly until risen and slightly golden. Pretty basic, in mixing bowl whip together butter, cream cheese until smooth, add powdered sugar, vanilla and pinch of salt, beating until smooth and fluffy, if needed add a teaspoon or so of milk or cream. 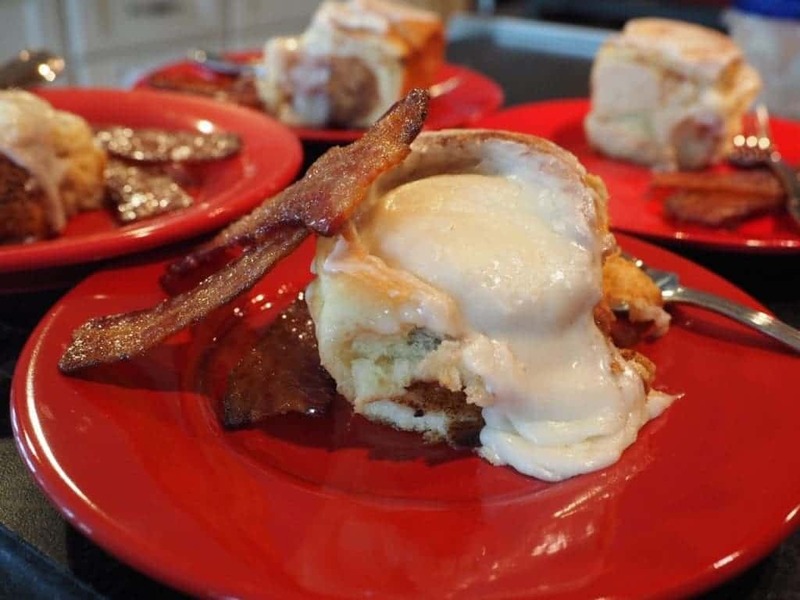 Smother over the tops of the warm rolls, serve immediately. Or spread on rolls individually. 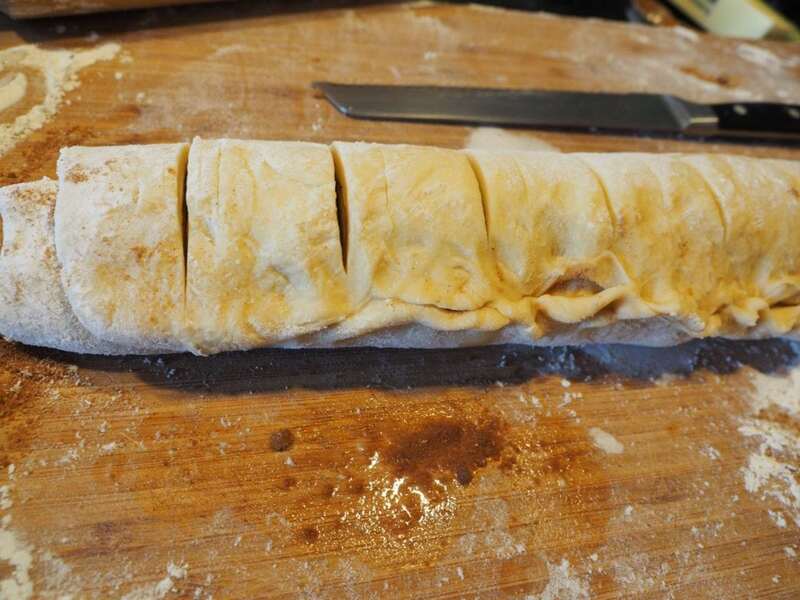 If desired, you can make up to the sliced roll stage cover tightly and put in refrigerator overnight they will rise slowly, take out in the morning bringing to room temp and making sure they are doubled, preheat your oven and bake. Also great for Easter are these super easy, light and fluffy yeast rolls! Give them a whirl! Want to make a truly decadent treat? Add this simple and amazing Brown Sugar Bacon to your menu. Line a rimmed sheet pan with foil. Set an oven safe cooling rack inside the prepared pan and set aside. In a shallow dish, place about ¼ cup brown sugar. Dredge the thick bacon slices in the brown sugar and arrange the bacon on the rack. Bake in the preheated oven until crisp, about 20 minutes. Transfer to a serving plate and serve immediately. You may also throw in a teaspoon of chili powder or a sprinkle of cayenne if you like a little heat. What’s your favorite Easter goodie?? Tender, better than Cinnabon ooey and gooey Cinnamon Rolls dripping with brown sugary cinnamon insides and topped with this luscious cream cheese buttercream. Remove butter, eggs and cream cheese from fridge, allow to come to room temp for recipe. 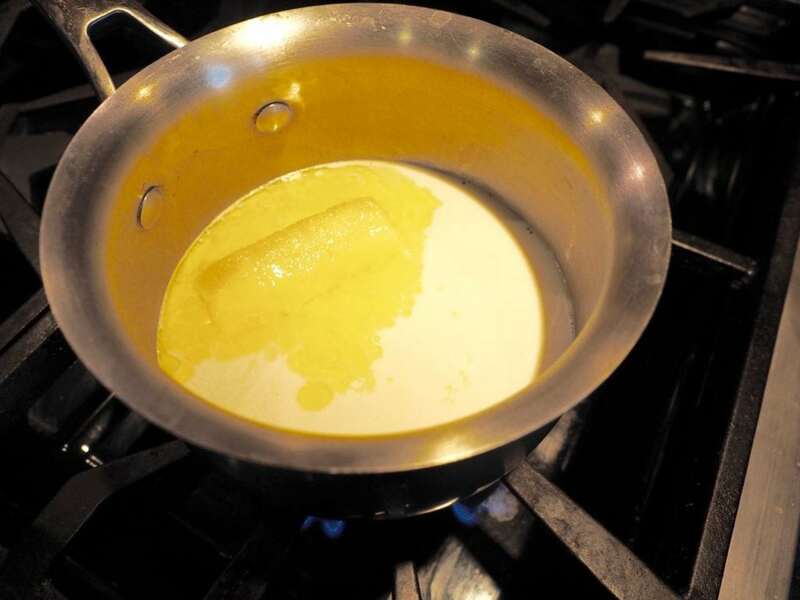 Combine milk, butter, sugar and salt in small saucepan and on low, bring to about 120 degrees. Careful it can go from warm to hot fast. If too hot (greater than 130 degrees), let sit until cools slightly. Butter may not be completely melted, that’s okay. 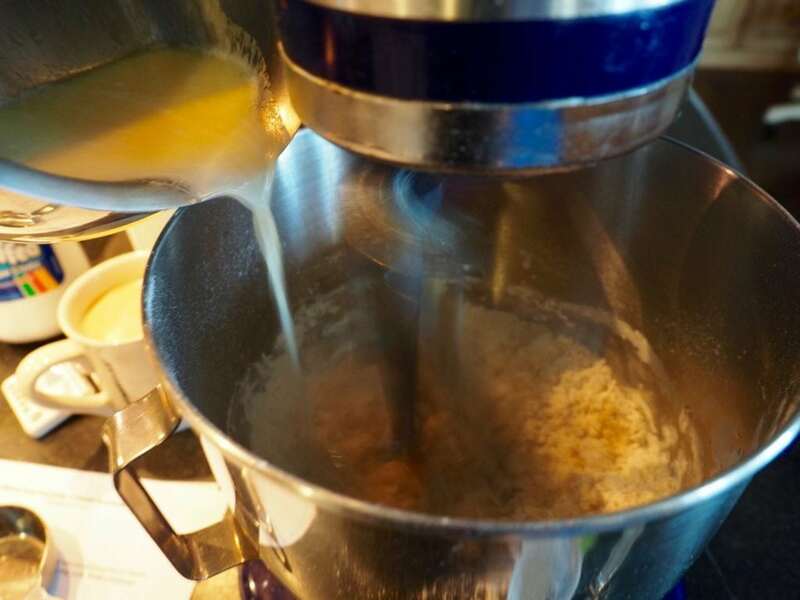 While milk is warming place 2 cups of bread flour and yeast into bowl of mixer and gently mix to combine. Slowly pour in milk, butter, sugar mixture into flour and yeast mixture, mixing on low. After mixing the dough and all flour in well, replace paddle attachment with J hook for kneading, knead for 5-10 minutes on a low setting, until dough is smooth and elastic. Don’t have a kneading attachment, turn dough onto floured surface and knead for same amount of time. Prepare your resting bowl, put a teaspoon of vegetable oil into a medium bowl and using a paper towel spread it all over the bowl. Plop your dough into bowl and turn to “grease” top and bottom, seal with plastic wrap and set in warm place for 15 minutes to rest. 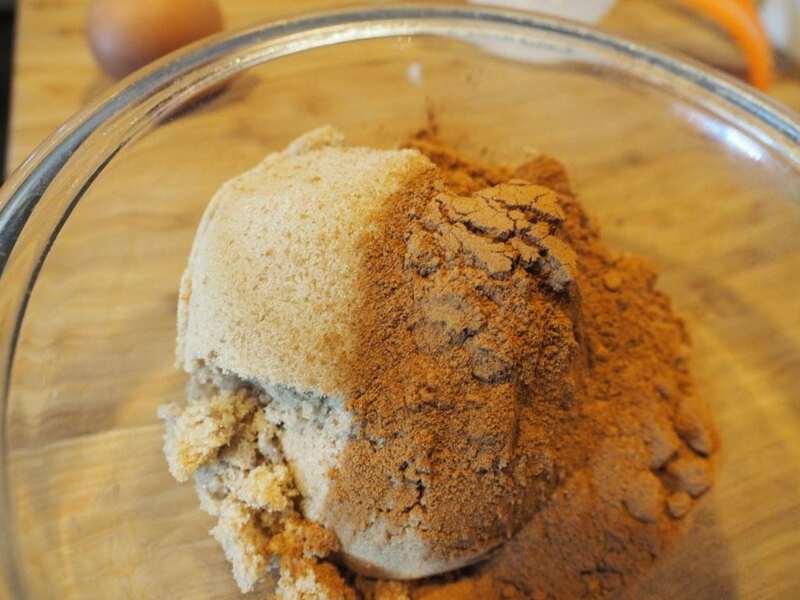 Meanwhile, mix together packed brown sugar and cinnamon well in a small bowl, set aside. 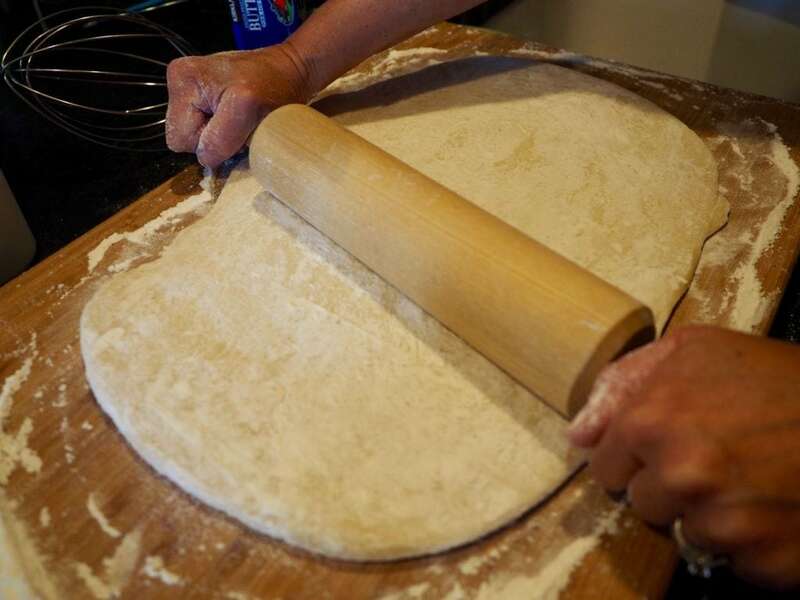 Once dough has rested, turn onto floured surface and roll out into 18×21 inch rectangle, roughly. Spread with ½ cup softened butter. 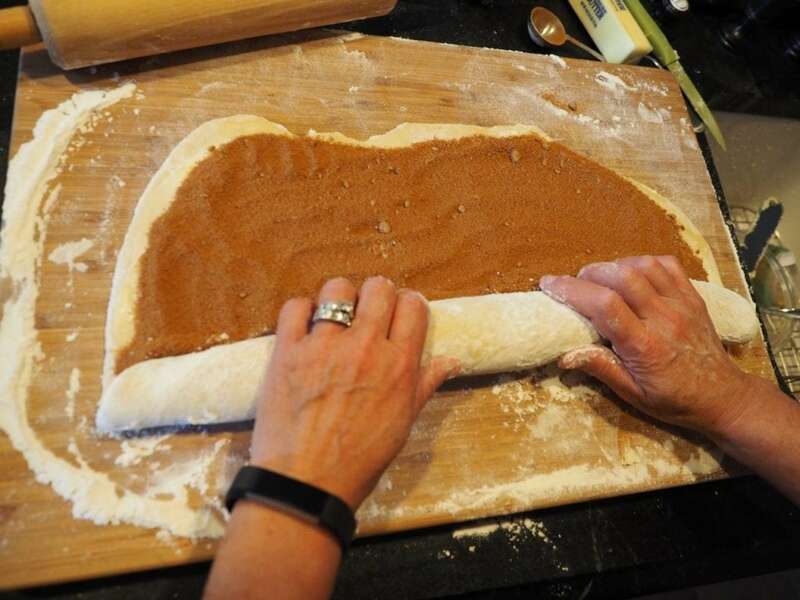 Spread brown sugar and cinnamon mixture evenly, spreading to within ½ inch of the edges. Roll, from long side tightly and pinch edges to seal, using a little water on seams if needed. 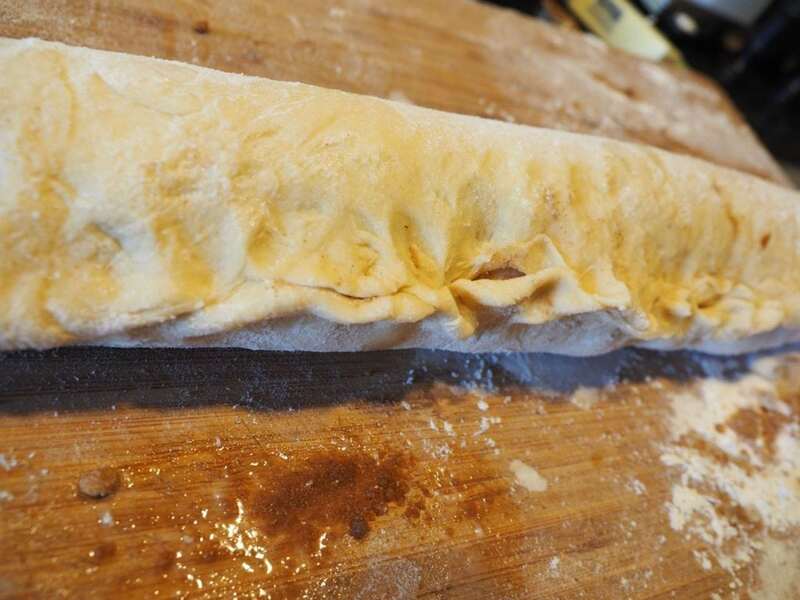 Cut into 10-12 evenly sized rolls and place in greased or parchment lined 9×13 pan. Cover with clean, damp tea towel (or plastic wrap) and allow to rise in warm place for about 45 minutes, until almost double. Preheat oven to 400 degrees, 375 if using a dark or glass pan. Bake rolls about 12-15 minutes until slightly golden. While baking or during rising time, make frosting. Place butter, cream cheese in mixing bowl, blend until smooth. Slowly add powdered sugar beating on low until incorporated, add vanilla and salt, blend until smooth. If needed add a teaspoon of milk or cream if too thick. Amount of powdered sugar depends on taste. 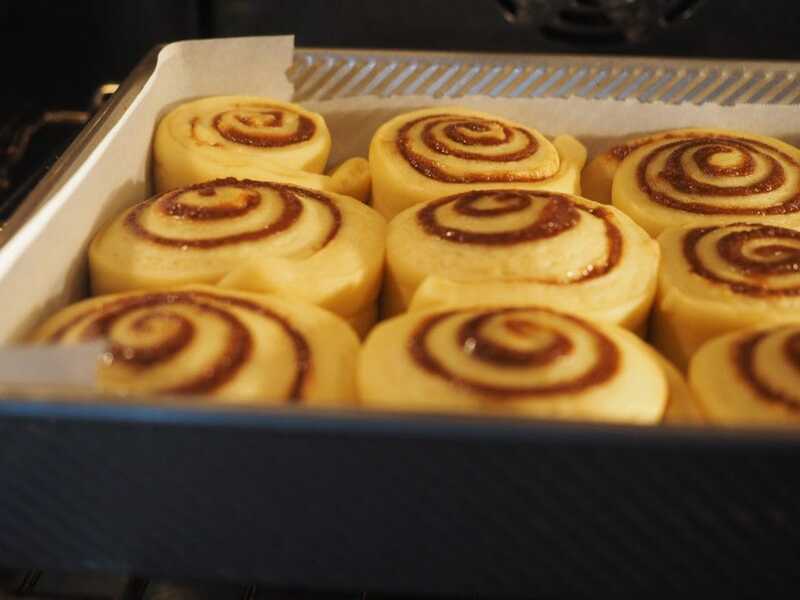 Smother warm rolls with frosting and allow to sit for a few minutes before serving. TIP: Forgot to take your butter out, try putting it in microwave for 8-10 seconds to soften. TIP: Need a warm place for the dough to rise? Preheat your oven on lowest temp and turn off before placing rolls in to rise, or if you have a proofing setting on your oven use that. Be sure to remove your rolls prior to preheating your oven. In a shallow dish, place about ¼ cup brown sugar. Dredge the thick bacon slices in the brown sugar and arrange the bacon on the rack. Bake in preheated oven until crisp, about 20 minutes. Transfer to a serving plate and serve immediately. Optional | Mix in a teaspoon of chili powder or a sprinkle of cayenne if you like a little heat. © 2017 | This recipe for The Best Ooey-Gooey Cinnamon Rolls was featured first on The Fresh Cooky. Love your engagement story… You argue! Never! The cinnamon rolls look amazing. I can’t wait to make them at our house. Happy Easter! Thank you Dawn! Um, yes me argue! 🙂 If you make them, let me know what you think! Loved reading your sweet engagement story! Thank you Lisa! Hope you are well!